The sunburst Fender Stratocaster that a young Bob Dylan played at the 1965 Newport Folk Festival when he famously went electric, perhaps the most historic instrument in rock 'n' roll, is coming up for auction, where it could bring as much as half a million dollars. Though now viewed as changing American music forever, Dylan's three-song electric set at the Rhode Island festival that marked his move from acoustic folk to electric rock 'n' roll was met by boos from folk purists in the crowd who viewed him as a traitor. He returned for an acoustic encore with "It's All Over Now, Baby Blue." Rolling Stone has called it one of the most notable events in music history. The guitar is being offered for sale Dec. 6, Christie's told The Associated Press. Five lots of hand- and typewritten lyric fragments found inside the guitar case - early versions of some of Dylan's legendary songs - also are being sold. The lyrics have a pre-sale estimate ranging from $3,000 to $30,000. His daughter, Dawn Paterson, of Morris County, N.J., has said her father asked the management company what to do with the guitar but nobody ever got back to him. Last year, she took it to the PBS show "History Detectives" to try to have it authenticated. The program enlisted the expertise of Andy Babiuk, a consultant to the Rock and Roll Hall of Fame and owner of an upstate New York vintage instrument shop, and Jeff Gold, a Dylan memorabilia expert. Both men, who appeared on the episode, unequivocally declared the artifacts belonged to Dylan. Babiuk took the instrument apart and also compared it to close-up color photos of the guitar taken at the 1965 festival. "I was able to match the wood grain on the body of the guitar...and the unique grain of the rosewood fingerboard. Wood grains are like fingerprints, no two are exactly alike," Babiuk said in an interview. "Based on the sum of the evidence, I was able to identify that this guitar was the one that Bob Dylan had played in Newport." Dylan's attorney and his publicist did not respond to email and phone requests for comment. Dylan and Paterson, who declined to be interviewed, recently settled a legal dispute over the items. The terms of the settlement were not disclosed but allowed Paterson to sell the guitar and lyrics, according to Rolling Stone, which wrote in July about Paterson's quest to authenticate the guitar. 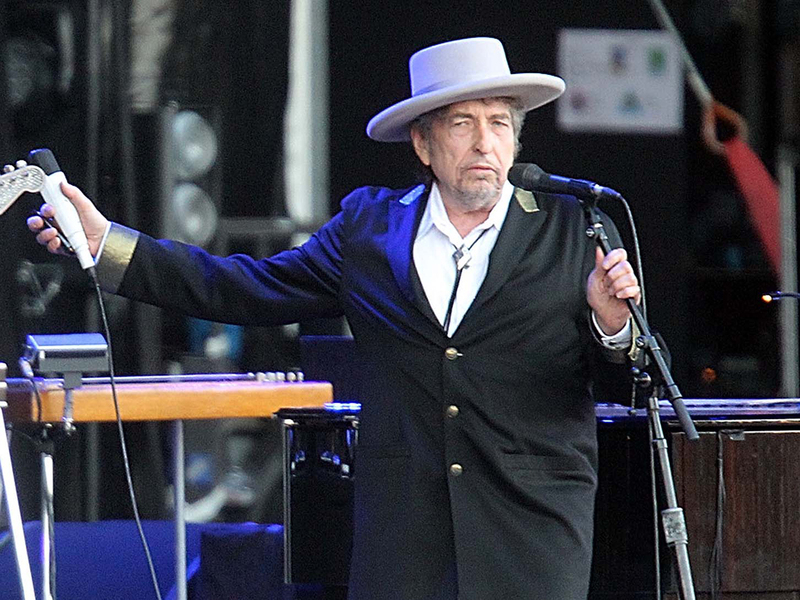 Dylan has generally looked upon his instruments to convey his art, akin to a carpenter's hammer, Howard Kramer, curatorial director of the Rock and Roll Hall of Fame, said last year. "I don't think he's dwelled on a guitar he hasn't played for 47 years," he said. "If he cared about it, he would have done something about it." The lyrics for sale include "In the Darkness of Your Room," an early draft of "Absolutely Sweet Marie" from Dylan's "Blonde on Blonde" album, and three songs from the record's 1965 recording session that were not released until the 1980s: "Medicine Sunday" (the draft is titled "Midnight Train"), "Jet Pilot" and "I Wanna Be Your Lover."